When I was blog hopping last week, my attention was caught by a recipe that I found on one of the blogs I recently discovered, Jenn Valmonte's "I Live To Eat". Jenn is also a Filipina Foodie who shares her food trips and other related food articles on her blog including her own cooking adventures. 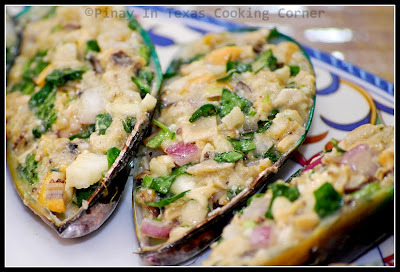 Last April 29, she featured a recipe called Mussels Relleno (Stuffed Mussels). Though I've heard about it, I haven't had it before. 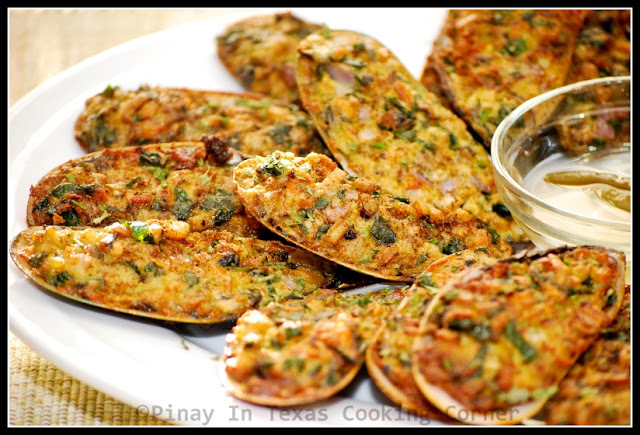 All I remember my mom cooking were rellenong manok (stuffed chicken), rellenong bangus (stuffed milk fish), rellenong alimasag (stuffed crabs) and rellenong talong (stuffed eggplant). Because making rellenong manok and rellenong bangus is quite complexed especially the deboning part, I never tried making them...but I've cooked rellenong alimasag and rellenong talong several times. 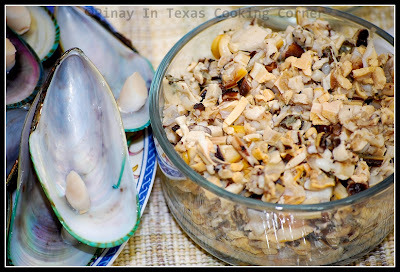 Jenn's recipe intrigued me enough that I promised myself to give rellenong tahong a try this week. Relleno comes from the Spanish word "rellenar" which means "to stuff". 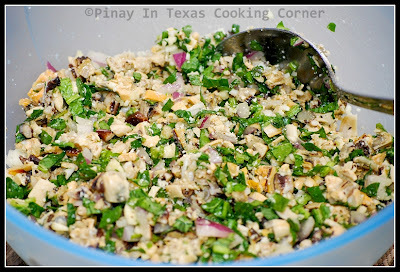 In the Philippines, ground pork and vegetables like green peas, carrots and bell pepper are used as extenders for relleno. Jenn's recipe called for ground beef, green peas and raisins. Because I intended to post my mussels relleno for my Meatless Fridays, I decided to totally alter her recipe. I thought of just combining mussels with vegetables. I kept on thinking what would be the perfect vegetable for this. I don't want the other ingredients to overpower the taste of mussels. After some serious thinking which lasted for about 30 minutes (LOL), I came up with the idea of using spinach. 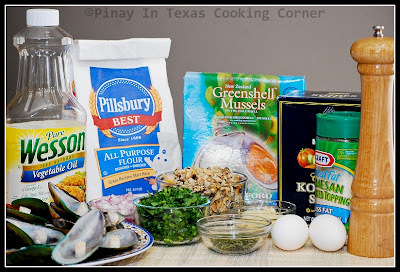 I've tried using spinach on my Mussels Tinola and I found it complementing the flavor of mussels very well. 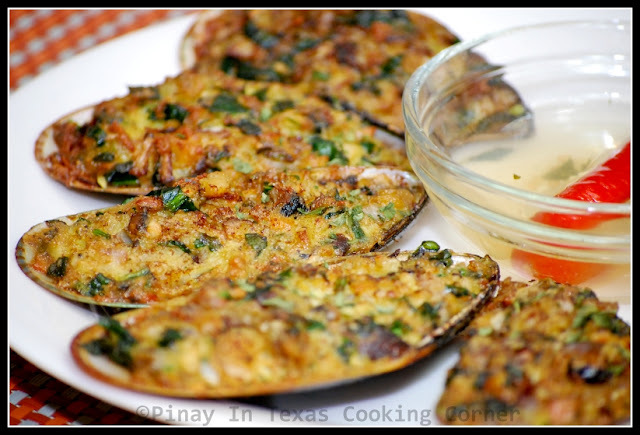 I was confident that it will work the same way on Mussels Relleno...and it did! Ryan and the girls loved it. So here I am, sharing the recipe with you. Thanks to Jenn for the idea of Mussels Relleno! I wouldn't have come up with this if not for her post! Do visit her blog, "I LIVE TO EAT" for a lot of mouthwatering recipes! *I'm sharing this on Fat Camp Friday, Friday Potluck@EKat's Kitchen, Foodie Friday, Fresh Bites Friday and Feed Me Tweet Me Follow Me Home. Prep Time:~15 mins Cook Time:~10 mins Yield: 24 pcs. 1. Remove mussels from the shells and reserve the shells. Chop the mussel meat. 2. 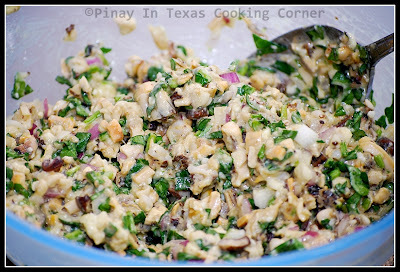 In a bowl, combine mussel meat, onions, garlic, spinach and parmesan cheese. Season with salt and pepper. Mix well. 3. Add flour and eggs. Mix well. 4. Spoon filling into reserved shells. 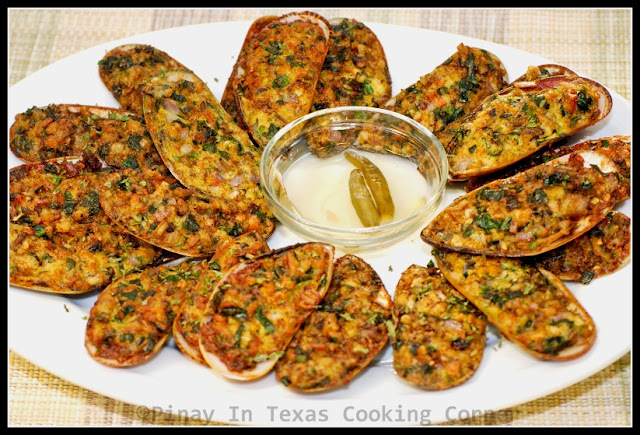 In a deep frying pan over medium heat, fry mussels in vegetable oil until golden brown. Drain on paper towels. Super thanks for the feature! I love how you photographed it! Hi! Those look wonderful! I love your blog! Tina your mussels look amazing. Looks like the perfect dish for entertaining friends too. Wow, look at those mussels relleno! Delish. Thanks for linking this with Fat Camp Friday this week! See you next week! Oh my goodness! This just made my heart skip! Yummy!!! I'm DEFINITELY going to try this. Let me see. I must be able to bookmark this page somewhere. I'm going to look through your other recipes too cause I LOVE to eat! Tina-I'm so glad that I'm following your blog, you have such awesome foods that you make, and share the recipes. These mussel shells are enormous, wish we had large ones like these in S. Florida. Such a yummy, and colorful stuffing...absolutely loving it! BTW-I have an award waiting for you to pick up (just copy and paste)...pay it forward, if you like. Nice recipe, Tina. I like the addition of spinach and parmesan cheese. Yum. Thanks for following. Am following you, too. I love anything relleno! I'm gonna try making these this weekend, Tina. Hopefully it turns out good. Thanks for sharing! How do you think they would hold up in the freezer for later use? Hi Erin! I haven't tried freezing my stuffed mussels. But I have tried storing them (cooked ones) in the refrigerator for 4 days. I wrapped them in foil and heat them up in an oven toaster for less than 10 minutes and they still tasted good. I guess freezing uncooked ones will work fine. Just wrap them nicely in freezer bags.